Posted by daveintexas in Crime, Gardening. But that scene where he’s carrying what’s his name with his crotch in his face made me laugh. I can’t decide which one I like best. So I am enlisting the assistance of the Innocent Bystander Commenters. 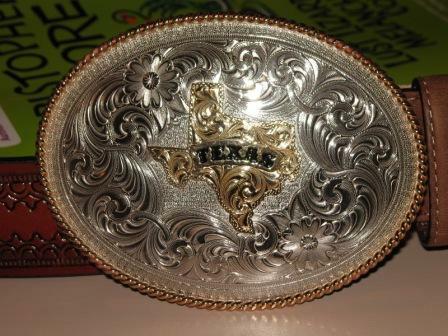 Please vote for your favorite garish Texas belt buckle. 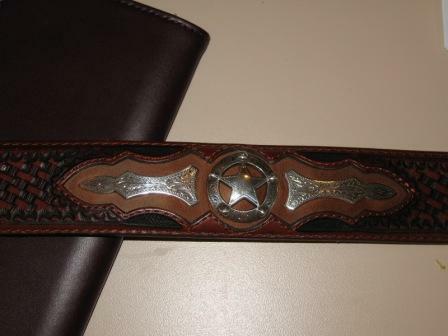 Just need help with the buckle, I’m good on the belt. Ok, buckle number one. A sassy little number, with a prominent Texas theme. Buckle number two. 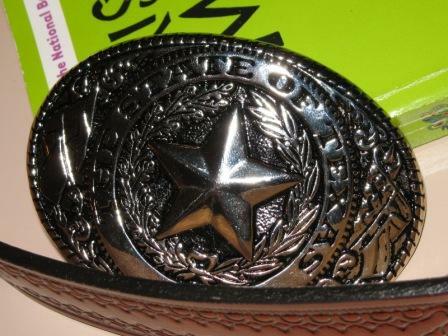 A little more subdued (a relative term when discussing belt buckles, so shuddup), I find it absurd yet flaccid. And finally, I’m leaning toward this little number. It’s got it all. Texana. Longhorns. A little splash of burnt orange in a sea of silver. Ok, IBers. Dress me up for Saturday night. I gotta look good, so what’ll it be? 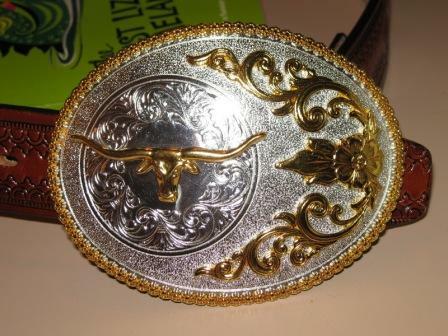 Pick the best lookin belt buckle for Dave in Texas! Many thanks. Employees of Dave in Texas™ or their family members are not eligible to participate. Chances of winning are approximately one in twelve. Or thirteen. Something. Honestly I can’t keep up with you morons. According to Geezer, this coming Sunday is the Official Innocent Bystanders Anniversary™. The earliest posts were actually in late March of 2006, when we were kind of getting organized, but April 1 was the official day when we installed the Sitemeter and went public. To celebrate this occasion, we are preparing a number of festive events and promotional offers. 1. Free manicures and paraffin hand treatments by Dave in Texas, who has been diligently researching this subject (at the cost of his manhood). 2. Free full-body Epilady hair removal by Bart. 3. Free horse rides from Retired Geezer. 6. Laura will ship water lily tubers to anyone who asks, for free! 8. Free deletion of six offending comments at IB, courtesy of Brewfan, the Assistant Site Administrator. 9. Free initial legal consultation from Sobek (that means he gets a chance to present you with his contingent fee contract). 10. Free tutorial from Mrs. Peel on your choice of (1) John Steinbeck, (2) Fun facts about electromechanical energy, (3) How to have a great time at the Renaissance Festival, or (4) How to sell a Jeep Cherokee. 11. Free emergency kit of Adult Pampers and Handi-Wipes designed by Compos Mentis. 12. Free sleep aids from Geoff (these are actually just the graphs from his blog, which analyze something to death). 13. Whatever you want for $200 from Feisty. Thanks to all of you for volunteering these services to make the Innocent Bystanders Official Anniversary™ a big success. Any additonal suggestions or offers to make this event special would be welcome in the comment thread below. Posted by BrewFan in Crime, Terrorist Hemorrhoids. No, this isn’t a post about Michael. It would appear that things are showing in the Recent Comments (in the sidebar) that aren’t in the comments themselves. Just ignore for now and I’m sure the Site Administrator will contact the proper authorities. Posted by rightwingsparkle in Politics. Posted by rightwingsparkle in News. On ebay. Right now. You knew it was only a matter of time, right? Posted by rightwingsparkle in Humor. I know. You can’t believe I posted this. Neither can I. But I thought it was funny. Last weekend I was doing my weekly download of banking and credit card transactions into Quicken, my personal finance software. In the process, I noticed that Citibank was flagging my credit card account for potentially fraudulent transactions, and wanted me to call. I did, and they told me that a database at TJ Maxx had been compromised. Because Mrs. Michael has made a charges that ended up in this database, Citibank was closing my account and sending me a new card. Not a big deal. This ultimately created a couple of hours of work for me getting the new account set up in Quicken and online, and reconciling all the transfers between accounts. But, in the aggregate the theft was a very big deal. Today it was reported that the compromised database involved a huge number of cards. BOSTON – More than two months after first disclosing that hackers accessed customers’ financial data from its computers, discount retailer TJX Cos. has revealed that information from at least 45.7 million credit and debit cards was stolen over an 18-month period. In a regulatory filing that gives the first detailed account of the breach initially disclosed in January, the owner of T.J. Maxx, Marshall’s and other stores in North America and the United Kingdom also said another 455,000 customers who returned merchandise without receipts had their personal data stolen, including driver’s license numbers. It seems like just a few years ago data privacy was not a big issue. Now, we are constantly under attack. Only a fool goes online without fortifying his computer with firewalls, virus protection, and anti-spyware applications, and even then you can’t be completely safe. It seems to be getting worse every year. The situation today kinda creeps me out sometimes. Posted by harrison in Ducks, Music, Personal Experiences, Philosophy, Science. Posted by skinbad in Ducks, Literature. I guess this might call for Michael’s corporate photo and my hacky photochop skills. Maybe if I get the will. In this heat . . . .
Posted by rightwingsparkle in Websites. It is worth recalling that the explosion of vulgarity, cruelty, and viciousness that the Web is mostly a phenomenon of the left. Hugh Hewitt linked to this informal study that shows left wing sites are 18 times as filthy as right wing ones. The French are rioting again. The police had to clear the Gare du Nord (northern trainstation) after they arrested a “youth” who hopped a turnstile, and other “youths” started a riot in response to what they perceived as unnecessary police brutality. Here’s another link. One thing the two stories (one from Yahoo News, one from Breitbart) have in common is that they both describe the rioters as “youths.” No other mention of what may have caused this sudden, completely unexpected outburst of youthful over-exuberance. They’re not exactly “surrounding” the story, here. The 2005 riots were distinctly race-oriented, were sparked (excuse the pun) after two north african “youths” fleeing from police hid in a transformer station and got electricuted, and the riots were mainly focused in north african immigrant areas. Of course, I only know that because I remember the riots, not because anyone at the Associated Foreign Press bothered to remind us of the cause of France’s worst riots for decades. Oh, and also, “Sarkozy, who left the government on Monday to run for the presidency, was accused of provoking the rioters by calling them ‘scum’.” We can’t escape the obligatory dig at the conservative guy running for President, even if we omit virtually every other detail about the riots. So after reading the two stories, I kept wondering if maybe there’s a racial component to this new riot. The fact that the AFP can’t be bothered to actually, y’know, report any facts is a tad frustrating. If the only reason the wires exist anymore is to serve as political action committees, shouldn’t they be forced to register as such?